I'm so so glad it's friday, this week just seems to have dragged and dragged. Nothing in particular has happened but I'm very happy to see the beginning of the weekend. Especially as the weekend means I get to paint my nails, by Friday I'm sick of seeing the same nails I painted on Saturday still on my nails. Although chip-free, they are growing out considerably so I'll be glad to change them tomorrow. These nails aren't the ones I'm currently wearing, those I'm saving for another day, and I hope you like them as much as I do! Today's design is another tutorial I created for Divine Caroline. This is a design that I could very easily have gone OTT with, and that was originally my intention. But once I'd done the 'first' part of the design, I loved the look so much that I decided to stick with a simpler design, which is something I never thought I'd say. If you want to see the full tutorial click here. I love this! Your color scheme is just perfect for this time of year! 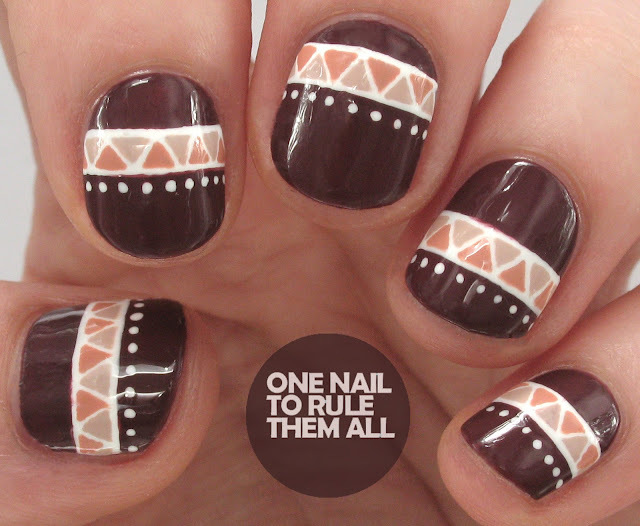 I love the fact these are just simple strips of pattern instead of a full nail design! These are so so gorgeous Alice!! Sometimes less is more and you definitely stopped at the perfect moment. Love these! So perfect for fall! I could see this mani going with anything. Pretty and simple! At the moment I am learning nail art design at the manicure academy. Hope, I`ll become such a great artist soon too.